This post brings together several threads from the past year’s work. 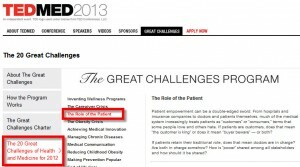 At the core is one of the Great Challenges for TEDMED 2013: The Role of the Patient. Roles exist in a context, and a new perspective on this context came to light today. Those who’ve seen me speak know I spend a lot of time thinking about the underlying structural issues that keep healthcare from evolving. In particular, leaders like Warner Slack MD have been saying since the 1970s that patients are the most under-used resource in healthcare. But many in the profession can’t imagine that participatory medicine could be valid. I don’t ask this as a whine, I ask it as an inquiry. Today on his blog Paul writes How a Team Degrades. It’s a tale of a Lean exercise his hospital used, which he connects to a recent soccer episode. And I see a parallel with the role of the patient. A group of colleagues sat around a table and were given a problem to solve. Each person wore a hat with a label that could be seen by everyone at the table, except the person wearing the hat. The label might say “whines,” “creative,” “combative,” “unintelligent,” or some other characteristic. Strikingly, within just a few minutes, people at the table began to treat each person as though the assigned characteristic were true. The soccer story happened out of town, in a game with people who didn’t know he’s a good player. Being stiff from a long plane flight he played carefully at first (and not well). Teammates (who didn’t know him) drew conclusions and stopped expecting him to perform usefully, stopped running in anticipation of him sending them a good pass, etc. The opposing team noticed and ignored him… please read the whole post to get the whole story. 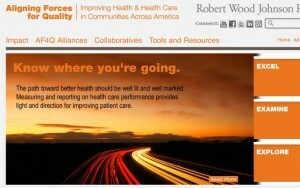 Paul says the soccer episode took him back to that Lean exercise … and Paul’s post takes me back to last November, at the annual meeting of Robert Wood Johnson Foundation’s outstanding multi-year Aligning Forces for Quality project. During Q&A after my talk, a woman from Maine named Poppy Arford said that the cultural challenges we’d discussed about empowering patients reminded her of the scapegoat dynamic in a dysfunctional family: once everyone decides one person is the problem, nobody listens to them anymore, and anytime anything goes wrong, all assume it’s the scapegoat’s fault. Poppy’s observation stopped me in my tracks and has stuck with me. If valid, it could explain a lot. … The whiner found himself ignored. Likewise for the unintelligent person. The creative person was seen to have all the best ideas. … There is a tendency of people, once given an expectation about another person, to find evidence in support of that expectation. Everything the other person does or says seems to lend validity to the prior view, which, by the way, may have no basis in fact. This so strongly smacks of what we hear about clinicians rolling eyes when patients try to contribute, complaints about patients not taking their meds (when an equal number of clinicians don’t wash their hands), etc. I propose that we all consider this – and don’t jump to conclusions: we need open minds all around. I’m not saying this as a complaint. Cultural disconnects are almost always blind, so step one is awakening, not complaint. Last Friday at the Work Well 2012 event where I spoke, I heard a great presentation on culture from Judd Allen, who made clear how strongly we’re unconsciously influenced by the social norms around us. As I say, step one is awakening – “consciousness raising,” as we called it in the Sixties. So here we are. But BOY what an awakening we need. At the big TEDMED conference last April, one speaker – the chief medical officer of a big diagnostic lab – spoke disparagingly of how patients are bad consumers. Given that it’s virtually impossible to find out prices – including from his lab, as I learned this year – his view can only be possible from within a misinformed scapegoat dynamic. Cruel: sounds like a scapegoat effect. In my experience most people involved with the problem don’t even realize how hard it is to get prices and be listened to. It starts with awakening. They bring actual patients/consumers to their meetings, so people get to hear what it looks like from the perspective of the ultimate stakeholder – the person whose life or whose family is on the line. In all the conferences and meetings I’ve been to, Poppy’s observation was a breakthrough, and it came from days of discussion with patients present as active partners. Let Patients Help Heal Healthcare! So just how does one, in a one-on-one situation with your doctor, go from being “ignored”, to “partner” in one’s health care? How do you get the doctor to see you as their partner in your health care, rather than the object of their few minutes in the treatment room? Great question, Tom! In my view it starts with knowing what you want (self-awareness) and then learning to express it effectively. Make no mistake, as I say in this post, this is culture change, and it can take time, just as feminism and civil rights and gay rights did. That’s why just giving speeches or handing out books doesn’t do it, any more than that was effective at changing industry by TALKING about Lean or Six Sigma. Even decades after a social movement, the pre-change status too often persists. But that doesn’t change what we want, and it doesn’t change that step one is simply to speak up and ask for what you want. Does this sound glib, or sensible, or what? What do you think? p.s. You can also join us in the Society for Participatory Medicine http://www.participatorymedicine.org/join-us and subscribe (free) to our journal there, and our blog there. In other words, educate yourself – feed your head. If we are talking hospital care, where many of the big unplanned costs reside we need to reach a Tipping Point. But this will happen ONLY when patients and their families join in the conversation, ask questions as suggested above, and say “wait a minute” when things do not seem as they should be. It is time to make the best information readily available and understandable to our communities so people can partner in these solutions. The system is very closed and complex but it is being opened…just not quickly enough for the 100,000 folks a year who leave us early due to errors. Mine is mainly on researchers but in the book, The Sorcerers and Their Apprentices by Frank Moss. It is about the MIT Media Lab that fosters tremendous amounts of innovation. This paragraph from there tells us what researchers think about their subjects. Amy Farber was diagnosed with a very rare disease, LAM, lymph-angiolio-myomatosis. She co-invented a revoluntionary web service that enables patients to participate in the search for their own cures. For the past five years Farber has been battling not only her own disease but also the wall of resistance erected by those who believe that a patient can make about as much of a meaningful contribution to the process of scientific discovery as a laboratory rat.